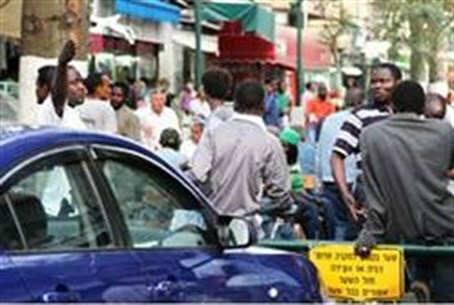 African infiltrators comprise approximately 25 percent Tel Aviv neighborhoods where they stay, according to official city statistics. Illegal African infiltrators comprise approximately 25 percent of the Tel Aviv neighborhoods where they stay, according to official city statistics obtained by Arutz Sheva Monday. In Eilat, the illegal infiltrators comprise 10 percent of the entire city’s population. The Tel Aviv figures take into account all of the southern areas of the city as well as a district that includes the central bus station and northern areas, where there are relative few infiltrators. There are approximately 25,000 Africans in southern Tel Aviv, according to statistics compiled by the Population Authority in coordination with the Knesset Research Center. They were published last week by the Hebrew-language Yediot Acharonot newspaper. City officials told Arutz Sheva that that the total population of the areas involved is slightly more than 100,000, including areas where there are virtually no illegal African infiltrators, meaning that the Africans make up 25% of the total. For the entire city, the illegal Afrcians make up approximately 6 percent of the population. The percentage is far higher when taking into account the number of licensed non-Jewish foreign workers, mainly from the Philippines and Thailand. In Eilat, the estimated number of Africans is 5,000, more than 10 percent of the tourist city’s population of 47,400. Their percentage of the total population is 2 percent in Arad and 1.5 percent in Ashkelon. Many of them loiter in pubic squares, where their contact with resident shoppers is far greater than the statistics imply. The increasing number of rapes and thefts in public areas and on Tel Aviv’s beaches have frightened residents, who have called on the government to take immediate action to deport them. Tel Aviv city officials said that the number of illegal Africans infiltrating into Israel continues to grow at the rate of 1,500-2,000 a month.